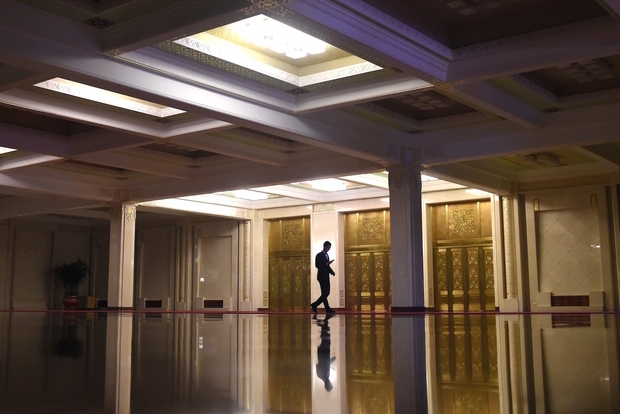 A man looks at his mobile phone as he walks in the Great Hall of the People before Cameroon Prime Minister Philemon Yang meets with Chinese President Xi Jinping in Beijing, June 19, 2015. It hasn’t even been a month since Chinese president Xi Jinping was in South Africa for the triennial Forum on China-Africa Cooperation (FOCAC) confab where he unveiled a massive $60 billion financial package. Oh how those were innocent, halcyon days. There was still a prevailing sense of optimism that everything would be O.K. In just a few short weeks, so much has changed. Today, the news is bad and getting worse. The slowing, sometimes faltering Chinese economy is sending shock-waves throughout the developing world and nowhere are those reverberations being felt more acutely than in Africa. This week, the South African rand plunged 9 percent to its lowest levels since 2008, due to mounting investor concern over the country’s dependency on trade with China. Currencies elsewhere on the continent faced enormous pressure as the Chinese yuan devalued against the dollar despite robust efforts from the Chinese central bank to hold the line. With every downward tick in value, the weakened RMB makes Chinese imports even cheaper for African consumers, which puts added pressure on local manufacturers who have long struggled to compete with a flood of low-cost Chinese imported goods. If the value of the yuan stays low for much longer, those African producers will have to start to cut costs (jobs) if they want to survive. Separately, new data also came in this week that revealed the depth of the Chinese pull-back from Africa. Chinese customs authorities reported that commodity imports from Africa fell 38 percent in 2015 compared to 2014. This, combined with an equally dramatic fall in Chinese investment in Africa last year, reveals that the Sino-African economic relationship is most definitely in a new, more austere phase. Few observers predicted the extent of this downturn with as much precision as Beijing-based attorney Kai Xue, who back in July 2014 outlined in precise detail all that is happening today. Kai Xue is an astute China-Africa analyst through his work advising Chinese enterprises who invest in Africa and abroad. He joins Eric and Cobus to discuss the current downward economic trends and what to expect from the Chinese-African economic relationship in 2016.